Home » Coast to coast » An eyewitness report from Columbia, S.C.
Bree Newsome taking down Confederate flag, June 27. 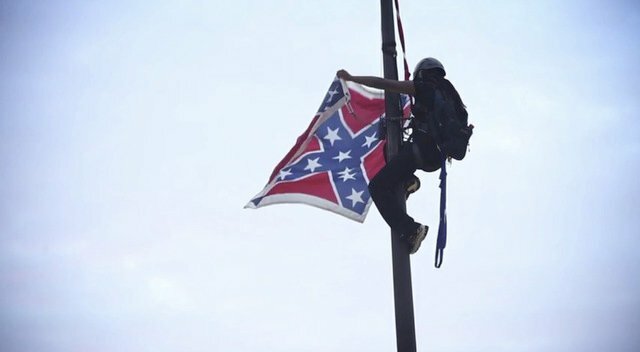 Columbia, S.C., June 27 — As Bree Newsome climbed the pole in the early morning of June 27, James Tyson stood at the bottom and helped her take down the pro-slavery Confederate flag in front of the state Capitol here. A group of supporters had come with them from North Carolina. Bree, who is Black, and Tyson, who is white, were arrested. They are environmental activists from North Carolina who have done a lot of protests involving scaling buildings. It was a cool operation, done with rappelling equipment. They are charged with defacing state property and face a possible three years in prison and a $5,000 fine. Both were released on bond; Michael Moore had offered to post it. The state put the flag back up within an hour, in time for a pro-Confederate flag rally at 11 a.m. When I got there, a small group of anti-flag protesters were holding their ground on the monument, surrounded by about 50 Confederate flag wavers. But soon more anti-racists arrived and were able to occupy the center. A young Black man arrived with a big U.S. flag and people cheered; that’s the irony of the situation down here. 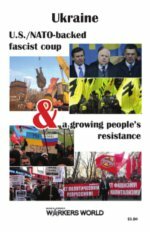 But shortly afterwards, a young Black woman arrived with the Black Liberation flag, which provoked some great discussion. By mid-afternoon militant Black youth and white supporters were surrounding the monument, while the Confederate flag supporters were driving around the Capitol with the secessionist rag on their vehicles.The overwhelming sentiment from those driving and walking by, Black and white, was to take the rag down.